The long-awaited trial of former Trump campaign chairman Paul Manafort is set to begin Tuesday. Here's everything you need to know about the case. The trial is set to being at the Eastern District Courthouse in Alexandria, Virginia on July 31. The case is being brought by the office of special counsel Robert Mueller, who is in charge of the independent investigation into Russian meddling in the 2016 election. The special counsel says it will need three weeks to try the case. The judge in the case, T.S. Ellis, has said that he doesn't think it will need to go longer than three weeks and would like it to wrap up in two. Paul Manafort, 69, served on President Trump's campaign from March to August 2016. He was originally hired to secure votes from delegates at the Republican National Convention but was promoted to campaign chairman after Mr. Trump fired Corey Lewandowski in June. Manafort was no stranger to politics, having also served as an adviser on the campaigns of President Ford, President Reagan, President H.W. Bush, and Bob Dole. As a lobbyist, Manafort has worked for various firms -- such as Black, Manafort, Stone and Kelly (BMSK) -- and most recently Davis Manafort Partners (DMP) and DMP International (DMI). Manafort's former co-defendant, Richard Gates, was Manafort's right hand man and worked for both DMP and DMI. DMI was created in 2011 as a result of Manafort's lobbying work in Ukraine. DMP and DMI had offices in the U.S., Ukraine and Russia. Manafort worked with a few controversial world leaders, including former Ukrainian President Viktor Yanukovych. The work that Manafort did in the U.S. on behalf of Yanukovych, the government of Ukraine, and Yanukovych's Party of Regions is at the heart of the special counsel's indictment. The Party of Regions, a pro-Russia political party in Ukraine, retained Manafort around 2006 "to advance its interests in Ukraine, the United States, and elsewhere, including the election of its Ukrainian slate of candidates," according to the indictment. Yanukovych was elected in 2010 but fled the country for Russia in 2014 in the wake of pro-Western protests. Manafort has been charged with four counts of bank fraud and five counts of conspiracy to commit bank fraud. In this case, he's also been charged with five counts of "subscribing to false United States individual income tax returns" and four counts of "failure to file reports of foreign bank and financial accounts." The maximum sentence for these 18 counts is 305 years in prison. However, the government is currently recommending that Manafort serve 8 to 10 years if he is convicted. As a result of their work with Ukraine, Manafort and Gates made tens of millions of dollars between 2006 and 2015. Neither Manafort nor Gates paid taxes on that income, instead classifying it as "loans" from offshore foreign entities, according to the government. They then used the money to purchase, refurbish and refinance their real estate holdings in the U.S.
Once Yanukovych fled in 2014 and they were making less money, the two used the properties as collateral for over $20 million in loans from multiple U.S. financial institutions. They secured the loans by inflating Manafort and DMP's income and not disclosing their debt, according to the indictment. Manafort and Gates then funneled millions to offshore bank accounts, which they failed to disclose to the U.S. government, in the Grenadines, Seychelles and Cyprus. Manafort then used that money to fund what the government terms his "lavish lifestyle" including the purchase of luxury cars. More than $75 million flowed through the offshore accounts, $30 million of which was concealed from the Treasury Department, according to the indictment. Gates pleaded guilty in February to charges of conspiring against the U.S. and of making false statements to the federal government. 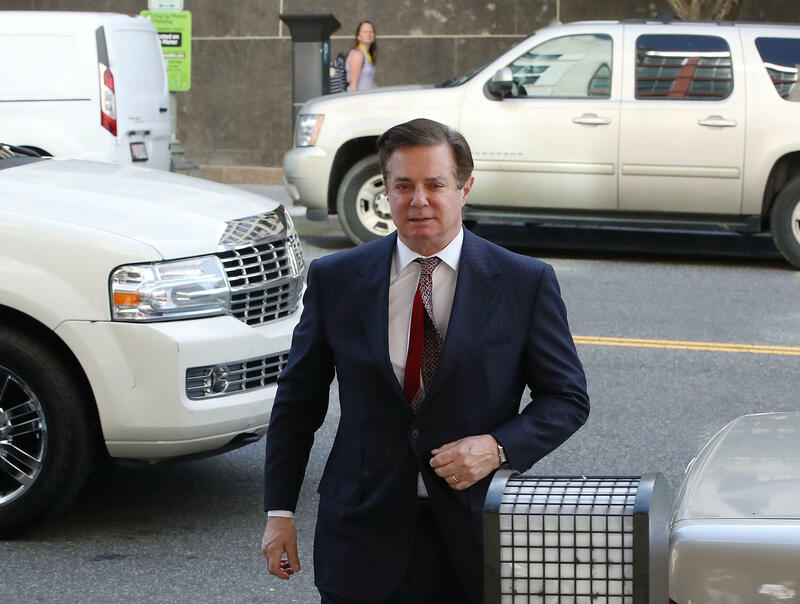 As a result of his plea agreement, all charges in this case were dismissed and he will be testifying against Manafort. Gates is still believed to be cooperating with the special counsel and no sentencing date has yet to be set. Gates worked as Manafort's deputy when he was chairman of the Trump campaign. After Manafort left, Gates stayed on as a liaison between the campaign and the Republican National Committee, according to CBS News reporting. He then helped plan Mr. Trump's inauguration in some capacity before he left for a job with America First Priorities, a pro-Trump group. He is reported to only have stayed at America First Priorities for a few months. Presiding over the case is 78-year-old Judge T.S. Ellis, appointed to the bench by President Ronald Reagan. He has questioned how the indictment of Paul Manafort on financial charges relates to Mueller's investigation on alleged 2016 Russian election interference. Ellis has said Mueller's team is pursuing the case in order to "tighten the screws" on Manafort in the hope that he will testify against others, including Mr. Trump. During a May hearing in Alexandria, Virginia, Ellis said, "I don't see what relation this indictment has with what the special counsel is authorized to investigate. "You really don't care about Mr. Manafort's bank fraud...What you really care about is what information Mr. Manafort could give you that would reflect on Mr. Trump of lead to his prosecution or impeachment," Ellis said. He also questioned why Mueller's office was pursuing the bank fraud charges against Manafort, but has handed off the investigation of Michael Cohen to prosecutors in Manhattan. Mr. Trump has referred to the judge's skepticism as "really something special, I hear." However, Ellis denied Manafort's request to dismiss the criminal charges against him, saying his lobbying work "warranted the investigation here." The special counsel's legal team in this care are prosecutors Greg Andres, Andrew Weissmann, Brandon Van Grack, Adam Jed, Michael Dreeben, and Scott Meisler. In addition, Uzo Asonye -- who works for the U.S. Attorney's office in Alexandria -- was brought on board after Judge Ellis told both legal teams to bring on local counsel. Manafort, meanwhile, is represented by attorneys Kevin Downing, Jay Rohit Nanavati, Thomas E. Zehnle, and Richard Westling. The Virginia trial is Manafort's first trial. He'll face another set of charges in Washington, D.C. in September -- money laundering and failure to register as a foreign agent with the Justice Department.